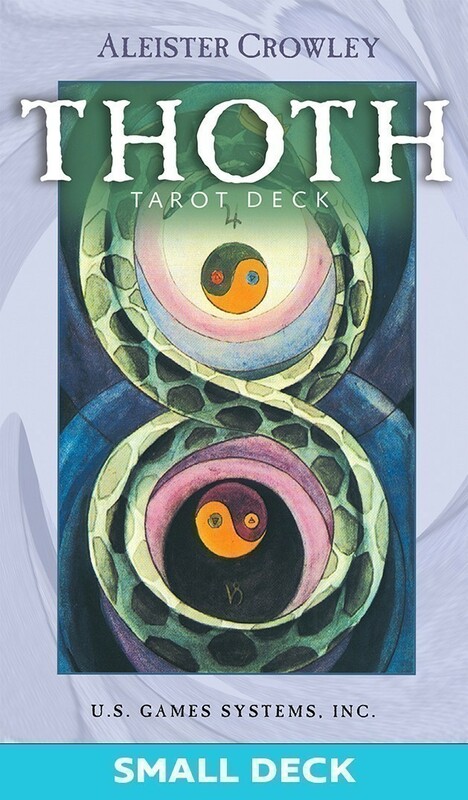 Crowley Thoth Tarot Deck Small features 78 cards painted by Lady Frieda Harris according to instructions from the occult scholar, Aleister Crowley, in a handy small size. The magnificent art deco work contains kabalistic and astrological attributions described in Aleister Crowley’s Book of Thoth. The art deco artwork of the Thoth is rich in Egyptian symbolism. To each of the twenty-two Major Trumps of the tarot is assigned, by tradition, a Hebrew letter and a path on the Tree of Life, as well as an astrological sign, element, or planet. The deck also reflects Crowley’s interest in alchemy and magic. The original Crowley Thoth Tarot has attracted a worldwide following, both for its striking beauty and for its complex depiction of occult knowledge. Since its initial publication in 1969, the deck has never been out of print. Included with the deck is a booklet of instruction, which contains two essays by Lady Frieda Harris and a commentary by Stuart R. Kaplan. Cards measure 2.75" x 4.375"